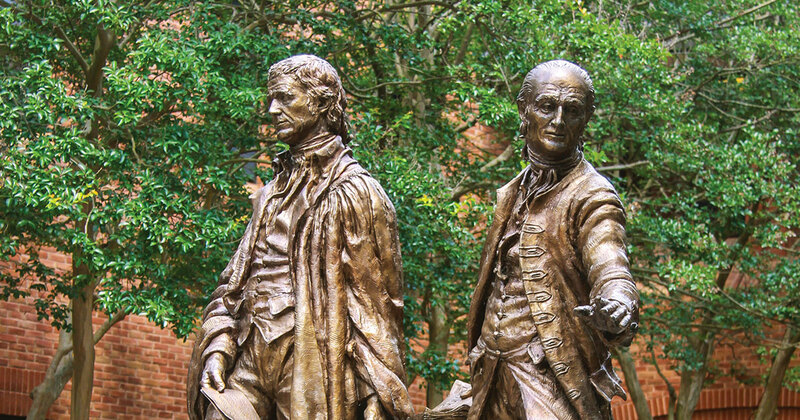 Find the John Marshall and George Wythe statues and you've found us. The Law School is located at 613 South Henry Street in Williamsburg, Virginia. We are a couple minutes' walk from the College of William & Mary's historic Wren Building and the recreated town of Colonial Williamsburg. Williamsburg is about 150 miles southeast of Washington, DC (and about 50 miles east of Richmond and 50 miles west of Norfolk). Looking for places to stay? Three airports serve Williamsburg: Richmond International Airport (RIC), Norfolk International Airport (ORF), and Newport News/Williamsburg International Airport (PHF). The Richmond and Norfolk airports are about an hour's drive from the Law School. Newport News/Williamsburg Airport is about 30 minutes away. Visit the airports' websites for information on making reservations for shuttle service to Williamsburg. Amtrak offers daily trains to Williamsburg from many places, including Boston, New York, Philadelphia, Baltimore, and Washington, DC. If you prefer to travel by bus, consult Greyhound for schedule information. Taxis are available at Williamsburg's combined train and bus station (located less than a mile from the Law School). Take I-64 West. Take Exit 242A (Route 199 West) toward Jamestown and Williamsburg. Turn right onto South Henry Street (Route 132 North) at the second light. Take I-64 East. Take Exit 238 (Route 143 East) toward Colonial Williamsburg and proceed about four-tenths of a mile. Bear right on Route 132 South - the Law School is located 2.5 miles from this turn. Take either Richmond Road or Jamestown Road toward Colonial Williamsburg. If you are on Jamestown Road, bear right onto South Boundary Street. If you are on Richmond Road, follow the road as it passes in front of the Wren Building. Go through the intersection - observing the "Yield" sign - and cross onto South Boundary Street. Take the first left onto Francis Street and proceed 1 block to South Henry Street. You are welcome to park in any faculty, staff or student space with a visitor parking permit. You can get a permit at The Wolf Law Library's circulation desk (to the right after you enter our entrance hall) or at the main reception area (to the left).